This is all about getting higher yields early in the season when you can get higher prices. It’s about going into the market with a bigger bang and reaping those higher prices. It does not apply during the growing season, because there are other economic factors involved. 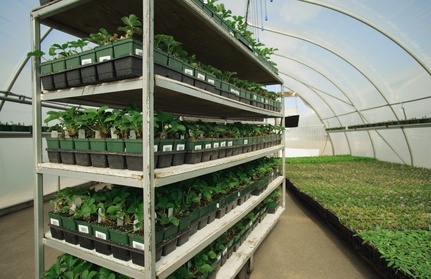 Remember, bigger plugs means less space in the nursery, so there is an optimum. You must be able to earn more profit (not higher turnover), by growing your crops in larger containers in a specific time of the season. Don’t just do it throughout the season, think about it and optimize your production system accordingly. It is a well proven scientific fact that the size of the plug has a significant effect on the early growth of vegetable plants, especially early yields. Remember, not necessarily higher total yields at the end of the growth season, just early yields. It is crucial to transplant seedlings well before they flower. Flowering during transplanting can reduce vegetative growth later in the season, and thus reduce total yields. That is why so many growers tend to remove the first flowers in order to promote vegetative growth in the beginning i.e. getting a strong plant early in the season. So using a larger container for your seedlings in order to get higher yields early in the season you have to ensure that there are no flowers during or on the transplanting stage. It has been found that transplanting larger seedlings of lettuce has generally resulted in larger heads earlier in the season. This must be combined with increasing the nutrient availability early on the growing season and minimizing any water stress (either due to very high humidity or too high EC). It is obvious that the longer a transplant is left in the nursery the larger it will get, but there is a cutof point whereby the seedling will stop growing due to environmental stress. One of the first limitations are root space. As the seedling grows, more roots develop and there is an optimum volume for a certain age. Once that is exceeded, the plant will stop to grow and this will have an influence on later yields. The same applies to the above ground parts. The leaves and stems need a certain volume to grow optimally, as soon as the the leaves start to touch other leaves growth tends to slow down. So seedlings grown in smaller containers, thus they grow closer to each other, will stop growing earlier than seedlings growing in larger containers. So what am I saying: the smaller the container size, the closer the seedlings are to each other, the quicker the stresses will limit the seedling growth. Seedlings growing in larger containers will take longer to reach the same stresses. The two main micro-climate areas that affect seedlings are above ground and below ground. Above ground factors are usually light. The more dense the leaves grow the less light is available for photosynthesis. It does not matter if seedlings are grown in seedling trays or beds, if the total volume for root growth is limiting, growth will be affected. Strangely, scientist tried to fool the plants by providing more light and ample above ground space but limiting root volume with no advantages. The plant reacted to the small and limiting root area, so the larger volume above ground space had no effect. The opposite is also true. limiting leaf are volume while providing ample root growth volume could not foot the seedlings. So a seedling will only grow as good as the weakest link in the whole environmental chain. The reason why seedlings with limiting root space have slower growth rates is not well understood. Many theories exist from a reduction in respiration rate to reduced translocation of starch (in cucumbers). Both tomatoes and cucumbers have a low leaf net assimilation rate when roots are confined. Other plants show lower levels of cytokinins and gibberellins and higher ethylene production than normal. Using larger container sizes will not double your yields. It is a small tool that can be used early on the growing season to maximize your opportunity for higher profits by targeting a specific market cycle. This ‘trick’ will not help if you do not have a higher price or any other price advantage early in the season. Using larger containers is not limited to tomatoes or cucumbers, it can be used with lettuce, cabbage, beetroot and many more.